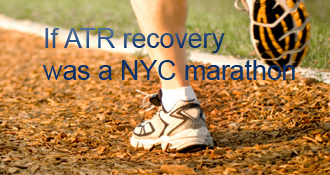 yorkshirelad68 has completed the grueling 26.2 ATR miles to full recovery! Since starting in two shoes, one point that I had not considered (until now), was the kind of shoes I could wear. Until now I’ve been pretty much wearing my trainers/sneakers which have a horseshoe shaped cut out at the top of each back. This has conveniently avoided rubbing on the wound site which I understand was/is about 3-4cms above where the tendon joins the heel. As I was to attend a smart casual do this week I thought I would give normal shoes a try. Not one pair could I find that didn’t give me hell by chaffing the wound. The tendon has healed somewhat ‘thicker’ than it was before so I guess I’m stuck with posh trainers unless I can find alternatives. Anyway that annoyance aside, on the healing front I am continuing to walk almost normally now without any pain or ‘dragging’ from the tendon and since adopting two shoes I have been incorporating standing two foot heel raises into the daily physio. After gradually transferring more weight to the injured side I thought I would have a shot at a single heel raise on that side alone but no matter how much I concentrated I could not get my heel to budge one iota, it was as though the heel was nailed to the floor. I am assuming rightly or wrongly that even though my calves are pretty similar in size there must be an acute lack of strength as yet in my right calf. When can I reasonably expect to be able to achieve this exercise from other people’s experiences? Any comments would be gratefully received. My physio currently includes daily sessions on static bike, x trainer, rowing machine, treadmill and vibro plate total of 1hr. Saw the consultant yesterday for the third visit since the accident. He carried out some foot articulation tests and then gave the tendon site a good going over before announcing that as far as he could tell all was OK and it had healed exactly as he would have expected at this stage. I fully expected to be re-booted for another 3wks until the new year but quite unexpectedly he said to go home then remove the boot and go into two shoes. When I inquired about physio he said that as my foot was able to articulate well physio was not needed and I should now just walk as much as possible to strengthen the leg etc. I was given a 10mm wedge to wear for up to 4wks or until I could do without it and was discharged from his care. I am trying not to ‘overstep’ at the moment as I can still feel a slight ‘drag’ on the tendon. It feels strange to try and re-educate my leg to assume a normal gait instead of having the boot via my shin lift the heel of my foot. At the end of the last update by ‘gravity’ was a seemingly good physio protocol to follow and I may incorporate that into my routine so my thanks for that useful info. I also tried the car (on the drive) today for the first time and pressing the brake pedal hard causes no discomfort so that may be another milestone passed. The past 8wks have been a drag but looking back I can now see light at the end of the tunnel. Finally for the moment A very happy Xmas and New Year to all fellow club members and many thanks for your comments and the support from this fabulous site. Many thanks to all who posted responses to my last update. In reality I think you are all perfectly correct that I should not try to rush things for a couple of weeks extra booted as It would be disastrous to cause a partial or full re rupture at this stage. By the time I see the consultant on Dec 12th it will be 7wks 4days from the accident so I anticipate he will want to keep me in the boot now until the new year return to work by which time it will be upwards of 11wks without starting physio. Walking in the boot is painless thanks to a small gel heel support that I have inserted as the heel was getting a little sore at times. I think I will follow the protocol involving mild physio of stretches etc with the boot removed that has been suggested as my Achilles feels fine and I have a good range of foot movement back without any feeling of tugging or pain in the tendon and no swelling that I can see. The only downside with the boot is that the height unbalance of some 75mm is taking its toll on both my knee and hip if I walk too far.For some reason I cannot access the protocols thar norm alluded to earlier nor can I access the Achilles profile update from the ‘user’ menu although I can access the ‘personal profile’. At least the crutches are a thing of the past. Good luck to everyone on this tedious journey. I have now been booted for the last 11days. I have been sleeping wearing the boot as advised but I have to remove it to put my sock on and off in the boot. Today I had the boot removed as usual and needed to get some items from the drawers at the other side of the room. I thought I would try to hop over without the boot and tenderly stepped out on my bad leg unsupported. To my amazement I could walk without pain although with a slight restrictive gait. I have been doing physio with the boot off at times by stretching and rotating my foot but I have not ventured forth without the boot before. Should I continue to exercise walking without the boot or is this too early to go unsupported at 6wks 2days. At last ditched the cast today and said hello to my leg again. After all that I’ve read on various blogs I was pleasantly surprised to see that there was hardly any size difference in my calf muscles. I was able to flex my foot into a rt angle position under the guidance of the consultant and am now in a walking boot for the next 3 weeks or so. I was told that physio would not start until at least week 8 and possibly week 10. When I walked out of the hospital to the car park my ankle felt a little stiff but otherwise walking was OK and not painful. The boot is set to lock at rt angles so as not to overly stretch the tendon as yet. I am told that the boot must be worn ALL the time, even in bed!!. What do you think about the time to starting physio and not being allowed to remove the boot. Comments gratefully accepted. Still in plaster no2 non-op with foot at about 20 degrees but found that I can push my toes down in the plaster and feel my calf muscle flex now. Also able to walk on tip toes without discomfort as I found out accidentally when I overbalanced on the crutches and took my weight on my bad leg. Should I continue with this when able or wait until the boot is fitted in 8days time? This is my first blog even though the injury occurred on Monday 18th Oct. After a lifetime of playing contact sports without any breakages a simple slip in the garden puts me in plaster for the first time in my life. A quick trip to A &E verified what I already knew had happened having seen the same happen to my badminton partner some years ago. Immediately after the rupture the pain was intense for about 30 secs, rather like when you go over badly on your ankle. A back slab plaster was fitted and I was sent home with crutches and a follow up appointment for the Friday 4 days later. At the follow up on the Friday the consultant confirmed that I’d made a pretty good job of the rupture and offered either op or non op. Having previously read all the fantastically helpful info on this site, especially from norm, I opted for non op and was put in plaster with my foot pointing down at some ridiculous angle and told to return in two weeks time (7th Nov). I couldn’t get on with the crutches at home so managed to concoct a walker made from a four legged padded stool with a frame attached that I can kneel on with my bad leg and this enables me to get around fine and have somewhere to rest my knee or sit and leave at least one hand free to carry things. Stairs aren’t too much of a problem on one knee and one foot and I come down backwards the same way. I find crawling the best way after getting upstairs. Had my second visit to the hospital today’s specialist says he can feel the tendon again where there was an empty channel two weeks ago. Plaster again for two weeks with the foot almost at rt angles now and then a boot at the next visit. Really looking forward to that. Luckily no pain or discomfort just frustration. Hi gravity, yes I do find it easier to walk with the bed slightly raised although the primary reason for this was to give the calf a little harder work to do. I am finding the exercise bike is probably the best for this as cycling was the way I built my calves in the first place years ago. I’m also at 11 weeks post-op (surgery on Oct 28) and it’s interesting to see you already working heel raises. I’ve been very eager to start really working the calf, but have been advised from my PT to not start any heel raises or additional ROM until the 12 week mark. I really only do leg exercises at PT, mostly squats and leg raises. I hope this means that once I do start doing these exercises they will come back quicker. ALso in terms of the rower, I have used it once and agree it is risky since you do need quite a bit of ankle flexion. WHat I do is keep the strap very loose and lift my heel off the rower when coming in. It’s probably not smart because it would be easy to forget to do this and accidently stretch it too much. Anyways, I also started a blog to keep track of my progress if anyone wants to take a read. My first post is progress up to 10 weeks. I seem to be taking it slow compared to you guys, my doc and PT are very conservative. We’ve had a few “polls” here, asking people how long before they could do a good 1lhr, or a bunch, or even an honest full height 50:50… Hugely varied results. Thanks for the responses HWGA & GRAVITY. Walking on tip toes may be an option later but at present not an option for my right leg. Even trying to hold my weight on an elevated right heel causes instantaneous collapse. Guess patience is required to progress to the next stage and I’m happy with being mobile and able to drive at present. On the subject of the rower, although there is flexion of the ankle there is absolutely no strain on the tendon as on mine it is perfectly possible to push back using the heels on the foot rests. Also I am NOT attempting running or jogging on the treadmill, just walking at a steady 4mph with a slight incline on the bed for a mile. I also think the rower is risky. Lots of ankle flexion and load on the tendon, I am waiting until 6 months before I hop back on my erg. On your physio, are you actually running on the treadmill, or walking? Also, the rower is the one machine I’ve been told to stay away from for now (in addition to running). Calf strength takes time to come back, I haven’t found any shortcuts that I can offer. Keep working the heel raises in a variety of forms and you will get there. Once double heel raises are conquered then raise up on both feet, transfer over to the injured leg and lower slowly on that leg. Walking on tip toes is also a good one. To get over that feeling like your heel is nailed to the floor then use the ball of the other foot to give a tiny push at the start, sometimes we actually need to give the brain a chance to remember the action. Good luck! Hi normofthenorth thanks for your comments must stress I am not recommending my recovery procedure to others just sharing my experience .Since my last post my achilles gets stronger daily .I feel my surgeon did a superb repair ,he does only feet and ankle injuries .Expensive but worth every penny .About a week ago realised had stopped thinking about my achilles ,however I remind myself to be careful .Maybe the moral to my story is to get very best surgeon .My sister is medical and has helped me through this period . Sounds great, Ian, but if you go too far you could still find yourself back at square one with lots of time to reconsider. Good luck. I’ve only seen one study that went so fast the results sucked. And even there, the rerupture rate was <<50%, so most people won the bet. Not my kind of risk to take, or recommend to others, though. Surgery has lower rerupture rates than old-fashioned slow non-op treatment, AKA Conservative Casting. But modern non-op ATR treatment documented in studies >2007 - including the three featured at AchillesBlog.com/Cecilia/ Protocols - yields clinical results statistically indistinguishable from surgery, without a scar and without most of the complications. When using emu oil and other solvent oils or chemicals that penetrate into tissues, always ensure that your skin is clean, or you’ll drive surface contaminants into your tissues. Emu oil is often formulated with Don’t inflammatories to exploit this action. No I’m not on blood thinners. Not sure if this is only offered after the op method. It was never mentioned to me but I do take a low dose aspirin daily anyway so maybe that is the reason. You don’t say which country you are in and I went non- op here in UK. Regardless I assume insurance companies are the same world wide and will try their best to weedle out of paying in any case. There comes a time with any injury when you have to try and get back to leading a normal a life as possible and mostly that depends on the individual. I have had more debilitating injuries in my time such as torn hamstring which caused far more pain and difficulty in driving than this but it was still necessary to drive at the time. Also probably like yourself I have officially been discharged from the consultant care and have been left to my own devices so to speak with no official physio needed so I am wholly responsible for my ongoing therapy and lifestyle decisions. My son in law is in the local police force and he says that it is fine to drive if my injury does not in any way impair my concentration or reactions which it does not. By the way I am 68. Best of luck with the rehab, take it steady and don’t overdo things even though you may think you can you are still healing. Glad you have a plan for exercises- your OS is right as far as prescribing walking but working on strength specifically is something that I think is pretty important. Heel raises are one of the main exercises in rehab and starting these seated should be the safest way to go. I am a bit worried about adding the rowing machine in though- I am a rower and a coach and have noticed that rowing is often left to the 6 month point on protocols. If you are going to row then modify the stroke- stay off the balls of the feet by shortening the slide and keep the drag factor at zero. Have fun and be patient! I’m curious as to how you feel about not being prescribed Physical Therapy? Don’t sell the boot yet. It’s useful for scarier outings - crowded areas, hilly terrain, etc. There’s also an exercise schedule in the UWO protocol - at Cecilia’s page or bit.ly/UWOProtocol - and maybe the other 2, too. Keep it incremental, and Watch Your Step! You didn’t mention limping or feeling vulnerable. If you’ve skipped those when starting 2 shoes, you’ve had a remarkable rehab! And if you add a title to thus page, it’ll be easier to cluck on it, in the list. And - last one for now! - if you turn on Ajax Editing, I’ll be able to tack this onto the previous comment, and fix typos, too. AchillesBlog.com/Cecilia/protocols should get you to the protocols. Weaning off the boot 8 weeks in is pretty standard in the good ones. Gel inserts underfoot are great, but a full-length insert is preferable because it doesn’t change your (prescribed) ankle angle. A heel pad does. Building up your “good side” shoe to match your boot is important. One guy (RyanB) came out OK by keeping his booted knee more bent, but its tricky for most to walk straight that way. I can’t solve your access problem, but if you’ve logged in with more than one identity, you may have to remember the other one. I like to follow the evidence. If a study got excellent results using protocol X, I see little to gain from going a week or two faster, and absolutely nothing to gain by going slower. I think the stats suggest that rerupture risks rise toward maybe ~10-ish weeks post-whatever, and drop fast at ~12 weeks. Not that the tendon is weaker or more vulnerable at 10 weeks than at 5, but we’re more active and more confident, probably less protected (shoes not cast or boot), so we’re more likely to test it to failure, either on purpose or by falling. In terms of lifestyle, I’d be tempted to rush FWB, but not 2 shoes, since it usually means walking slower and feeling more nervous — i.e., a negative lifestyle change. It’s got to be done to return to normal, of course, but most of us didn’t find it a joyful milestone. Take it from someone who was wearing the boot fell and put pressure down on my bad foot while in the boot causing a minor rerupture and a whole Lotta pain. Beak careful. I’m at 8 weeks post ATR non-op & just went to 2 shoes; I did cheat and do it a couple of days early but that’s all. However I really wouldn’t rush if I were you, it’s not as if going to 2 shoes is some miracle cure! I can’t walk any faster in 2 shoes than I could in the boot. In fact I think it’s slower…. Now realising how slow the journey back to just walking normally will be. Buffie, I fully agree with you, I think if there is one thing that I believe is important for people to take from the various stories on this site, it is that there is actually fairly little to gain from doing something a week earlier or later (as long as one is following some of the modern protocols), it’ll even out in the long run (which is what this injury is all about). People that have the same treatment seem to have drastically different experiences with regards to e.g. pain, swelling, strength retention and recovery, but most people tend to end up in roughly the same place in the long run. Having said that (and again not bothering to dig as someone probably knows), what are the stats on the re reruptures in terms of the highest risk period? I know that the risk doesn’t significantly drop until 10-12 weeks, but when do most of those happen? Play the game right - wear that boot and you will be ok. Do something silly and pay the price, Being stitched may make little difference as previous re-ruptures have shown in this blog. You may well be right, for some reason I thought he was surgical and didn’t check the older posts unfortunately. By reason it certainly makes sense that very early on you’re somewhat safer with a stitched vs non-op. gravity I think you have had a surgical repair and lad is non-op- if that is the case then the transition out of a boot for walking/weight bearing would be very different. In my opinion removing it for exercises etc is a great thing but hopping around the place without a boot is plain craziness. There is lots of things that are possible at 6 weeks non-op that would keep the rehab “aggressive” , risk free and be functional, but I think cutting a couple of weeks off the accepted protocols is risky. Sounds way too early to me. At 6 weeks non-op your tendon still has a lot of strength missing. The protocols all wait to 8 weeks so thats is what I would be doing! Had a slight setback last weekend. Caught the boot toe going up some steps and automatically thrust my bad leg out behind me to check the fall. NOT A GOOD IDEA! When my toe contacted the step my heel jammed down and gave my tendon the equivalent of 2 months Pt in one second flat! The pain was horrendous and I thought I’d reruptured. Spent the next two days on pain killers with my foot up whilst the bruising came out. Back in the boot now but still pulling a touch on the tendon where it wasn’t before. A quick Thomson’s confirmed I’m still attached. I sleep in the boot at present but like you pulled it off last night as it was too tight. Woke up my wife with the Velcro tearing undone but without the boot going to the toilet is a crawling session. I couldn’t bear wearing my boot in bed after week 5, and even sometimes took it off while asleep. I would wake up daily with it thrown across my room lol! My physio starts this Friday after 7 weeks, and I’m excited. I agree exercise is key to getting it going, I walked 15 miles 3 weekends ago, and while it tired me out for a week I felt it was really beneficial! I hope things get better fast for you! Waiting until the 8-10 week mark seems like too long to me. The initial stuff is very gentle, getting a good range of movement. The next step is adding proprioception and balance which can be done seated so is very safe. The way I look at it is that there will be lots of exercise needed and starting early gets things started in a very controlled and incremental manner. It may be worth seeing a private PT and setting up a progression to get you through the next few weeks. I slept in my boot till just after 7 weeks but took it off often when elevating, icing and of course doing my PT routine. All the best! I’ve installed the timeline as you suggested and updated my present condition to FWB. The boot is set to neutral (I think) as it will allow me to flex my foot downwards as far as I want but when walking it automatically locks at neutral so that my tendon cannot stretch. I have taken comments from gravity onboard and am removing the boot when I am sat on the couch and gently flexing my foot until I can feel a tugging on the tendon. I will probably continue this until my next appointment in 3 weeks time. Walking in the boot is fine although walking up slopes is causing a tugging on my tendon and it is not possible to drive as yet unfortunately. Happy days!! Thanks for your response. I am thinking that 8 weeks before physio starting is probably too long and I’ve done as was suggested to you and removed the boot whilst I am sitting on the couch. This gives me the opportunity to massage my leg and also to perform some gentle flexings. I can flex pretty well until I feel a tug on my tendon so I will probably continue with this for the time being. Walking in the boot is fine, except walking up slopes does pull on my tendon a touch however it is sooo nice to be out of the cast and be full weight bearing. I was encouraged to start PT as soon as my cast came off (4 weeks post op). Though my PT initially composed of mostly gentle stretches and ROM - it helped a lot! I too, didn’t have a huge difference in calf size but part of that probably had to do with swelling and the fact that my injured leg was always a little bigger than my non-injured leg. They both look pretty symmetrical now at almost 5 moths. Lad, if you can install the ATR Timeline Widget (instructions on the Main Page) we’ll all be able to see how long it’s been, which leg, where you are, etc., and give you smarter answers. Is your boot locked/fixed at neutral=90°, or is it hinging down and stopping there? The fact that you’re walking well in the boot is very good news, but most of us - and the most successful published studies - seem to have benefited from early PT. I followed the UWO study, so I started PT, very gently, at 2 weeks in. That study got very good results, post-op and non-op, though that isn’t proof that PT is essential - or even helpful, though it seemed to. I think the timing of the physio depends on what the definition is. I had the first meeting with my PT when the cast came off, not really doing much work with her, she mainly checked some of the ROM, and took me through some exercises to start with right away. Regarding the boot, I was actually encouraged to take it off when at home on a sofa etc, with the thinking that with the boot off I’ll always do a little movement etc, obviously also need to take the boot off for the rehab exercises. Having said that, was told to sleep in the boot for sure for the time being. All in all, having boot on all the time when moving around seems normal, but not having any exercises etc until 8 weeks seems like a long wait to me. Thanks for that nosport45. Although I can walk on the fiberglass cast it does put pressure on the underside and back of my heel which tends to make it sore if I do too much. I rely mostly on my knee walker that I have knocked together from a padded 4 legged stool with a handle attached that I can use as a wooden leg leaving one hand free to carry things and also for stability when I stop. I have been promised the ‘boot’ this coming Friday at my next appointment and I can’t wait to get mobile properly again. Good luck with the recovery. I also went non op in Yorkshire. Cast for two weeks n boot for 12 . Think Norm giving you good advise there, don’t put weight on your cast unless directed. Being creative and positive is definitely the way to go. The cast is fibreglass and to ensure not too much stress I am using a crutch to lessen the impact at the moment. yorkshirelad68’s AchillesBlog is proudly powered by WordPress and WPDesigner..